Description: The issue of wealth and poverty and its relationship to Christian faith is as ancient as the New Testament and reaches even further back to the Hebrew Scriptures. From the beginnings of the Christian movement, the issue of how to deal with riches and care for the poor formed an important aspect of Christian discipleship. This careful study analyzes the significance of wealth and poverty in constructing Christian identity in the complex socioeconomic situation and cultural milieu of the early Roman Empire. Helen Rhee shows how early Christians adopted, appropriated, and transformed the Jewish and Greco-Roman moral teachings and practices of giving and patronage. She examines how early Christians developed their distinctive theology and social understanding of wealth and the wealthy on one hand and of poverty and the poor on the other, demonstrating that this understanding impacted early Christian identity formation. She also explores the vital role wealth and poverty played in the construction of eschatology, soteriology, and ecclesiology in the social and cultural context of the time. In addition, the book draws out relevant implications of early Christian thought and practice for the contemporary church. Professors and students in courses on Christian origins, early Christianity, church history, and Christian ethics will value this work. 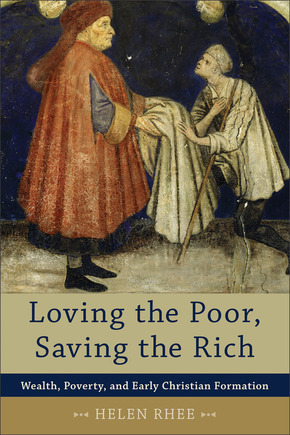 Citation: Michael S. Moore, review of Helen Rhee, Loving the Poor, Saving the Rich: Wealth, Poverty, and Early Christian Formation, Review of Biblical Literature [http://www.bookreviews.org] (2014).